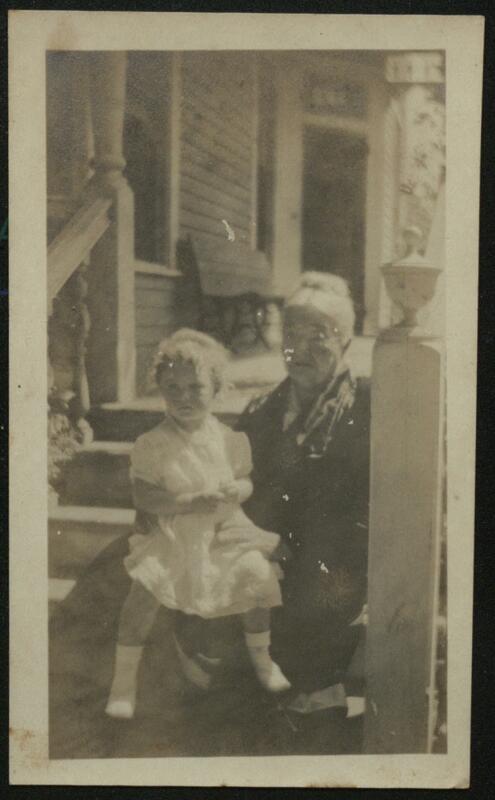 A photograph of Novaline James Baldwin with her great-granddaughter, Edwina, on steps. Novaline was born in Montgomery, Alabama, on August 26, 1841, to Isaac Dorgan James and Sarah Ann James, or Sarah James Lavangee. She married a George Baldwin on March 3, 1864, in Mobile, Alabama. She and her family resided in St. Louis, Missour,i from 1864 to 1879. She died at the age of 86 on January 25, 1928, at the home of her daughter, Sadie B. Bettis, and is buried in Magnolia Cemetery. She had lived in Beaumont for 35 years. Edwina Holland Winter was born on September 11, 1917, in Orange, Texas, to her parents Edgar Alfred Holland and Novaline Bettis Holland. She married a John Dawson Winter, Jr., on February 5, 1943.